Rangers proved too strong for Aberdeen and leapfrogged them into second spot in the SPL in a festive cracker. Both sides attacked from the first whistle and Aberdeen's Darren Mackie struck a post before Nacho Novo's mis-hit shot looped into the net. Novo turned provider in 23 minutes when his drilled cross was swept home by Libor Sionko from six yards. Steve Lovell pulled one back for the Dons with five minutes to go, but Rangers held on for a deserved victory. Aberdeen were unchanged for the visit of Rangers, which saw Pittodrie Stadium sold out for a competitive game for the first time in 11 years. Injured defender Richie Byrne was Aberdeen's only absentee for the battle of second against third at Pittodrie. Rangers, two points behind at the start of the game, brought in Sasa Papac to replace left-back Steven Smith, who has a groin injury, while long-term casualties Kris Boyd, Chris Burke and Ian Murray remained sidelined. Aberdeen threatened in their first attack of the game, but Mackie could not control Jamie Smith's through pass. Mackie then hit the post for the Dons with a rasping 20-yard drive after 10 minutes and the ball rebounded to safety. Novo then spurned a great opportunity when his attempted lob over Jamie Langfield from six yards sailed over the bar. Novo put Rangers ahead after 21 minutes when his mis-hit shot from Sionko's cut-back evaded Langfield's despairing dive. The goal was the first Aberdeen had conceded in the first half of an SPL game since the opening day of the season. Rangers took advantage of poor Aberdeen defending to go two up when Novo drilled in a low cross which Sionko rifled past Langfield. Barry Nicholson saw his effort from 18 yards fly over the bar just after the half-hour mark as the Dons tried to get back into the game. Aberdeen struck the woodwork again just before half-time when Lee Miller stole the ball from Hemdani's feet, but could not find the net. Sionko could have wrapped up the points 60 seconds later, but his shot was blocked by Langfield. In the second half, Aberdeen's Zander Diamond replaced Smith, and Sebo came on for Dado Prso for the visitors. Miller shot straight at Langfield from eight yards with half an hour remaining, as the Dons' profligacy in front of goal continued. Aberdeen set up a tense finish when Mackie pounced on substitute Gavin Rae's headed back pass, and squared to Lovell who tapped-in from six yards. Aberdeen: Langfield, Hart, Anderson, Considine (Lovell 61), Foster, Nicholson (Maguire 75), Severin, Clark, Jamie Smith (Diamond 46), Miller, Mackie. Subs Not Used: Soutar, Dempsey, Touzani, Daniel Smith. 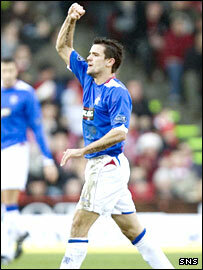 Rangers: McGregor, Hutton, Hemdani, Svensson, Papac, Sionko, Ferguson, Clement, Adam, Prso (Sebo 56), Novo (Rae 81). Subs Not Used: Klos, Buffel, Rodriguez, Stanger, Lowing. Goals: Novo 22, Sionko 24.